The Declaration. This fence screams “THIS IS A DIFFERENT KIND OF PLACE!” to everyone who passes by. Up until now, “A Preferred Women’s Health Center of Raleigh” has made every effort to blend in. Don’t think so? Then how do you explain even the name? They may kill babies inside, but the outside is one of a million normal, respectable office complexes, and that is totally by design. Attention is the last thing an abortion clinic wants. Now, complements of THE FENCE, this place of business looks like a seedy massage parlor, complete with a parking lot hidden from view. For a group that is only present two hours a week, I don’t know how we could hope for more than this 24/7/365 declaration. Scream on, fence. Scream on. The Symbolism. What could be a better symbol of shameful things done in secret than THE FENCE? Consider Ephesians 5:12: “It is shameful even to mention what the disobedient do in secret.” (NIV). Why are people so bothered by the graphic pictures on the signs held by some pro-life protesters? Is it because the pictures represent falsehood? No – they are actual pictures, absent any commentary. No commentary is needed. These signs are disturbing – to friend and foe alike – because actual pictures of what happens in an abortion clinic present the unspeakable. It is shameful even to speak of what is happening in there behind the six foot wall of secrecy. THE FENCE tells the tale. The Irony. A world where people committing murder need to be shielded from those who are pleading for their pity is a world turned on its head. Everything is upside-down. Is the remaining twinge of conscience really so dangerous that no one should indulge it before going through with a life-changing – and life-ending – act? Apparently some think so. 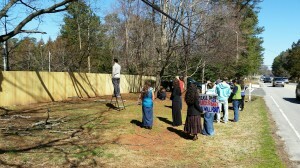 Maybe the subtle absurdity of THE FENCE will be like a splash of cold water to those who are coming. Sometimes it is irony that jolts us awake. May it be so with THE FENCE. I want everyone who comes to this clinic hurtling towards the day of the perfect justice of God to hear of the liberty that Jesus Christ has proclaimed to the captives, that they may trade their ashes for beauty, their mourning for joy and be free. “Therefore if the Son makes you free, you shall be free indeed.” (John 8:36). And if we have to find lawful ways to proclaim this good news over or around THE FENCE, so much the better. This entry was posted in Abortion, abortion clinic and tagged abortion, abortion clinic, fence on February 19, 2015 by Jason Dohm. Most Saturdays for the past few months, a young couple has joined us for a few minutes outside the Jones Franklin Road abortion clinic for a goofy sort of counter-protest, making use of social media and calling it Saturday Chores. Their shtick has been for one to hold a sign that they find random or humorous or both, the other to take a picture, and then to use that picture to add to a series of pro-choice posts. Their humorous approach has been universally praised by the media outlets that have picked this up over the last week or two. Here is the problem: the death of babies isn’t funny. When mothers are in crisis, it isn’t funny. So there is nothing praiseworthy about their approach, because babies are dying every day on the other side of that clinic door. And the mothers who are coming, having been told and wanting to believe that they are solving their problem, are only increasing their troubles exponentially. A baby isn’t a problem, and abortion isn’t a solution. These women need the hope of the good news of Jesus Christ, along with caring practical help, which is exactly what we are there to offer, and that is no laughing matter. That is why I am so glad that Taylor Tsantles is leading the effort to carefully articulate what we are doing at the clinic and why at hopebeforethedoor.com. You will find visiting well worth your time. 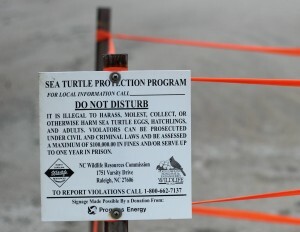 That’s right: mess with a turtle egg and you just might be facing a $100,000 fine and a year in prison. But kill your baby and exit the clinic to a round of applause. 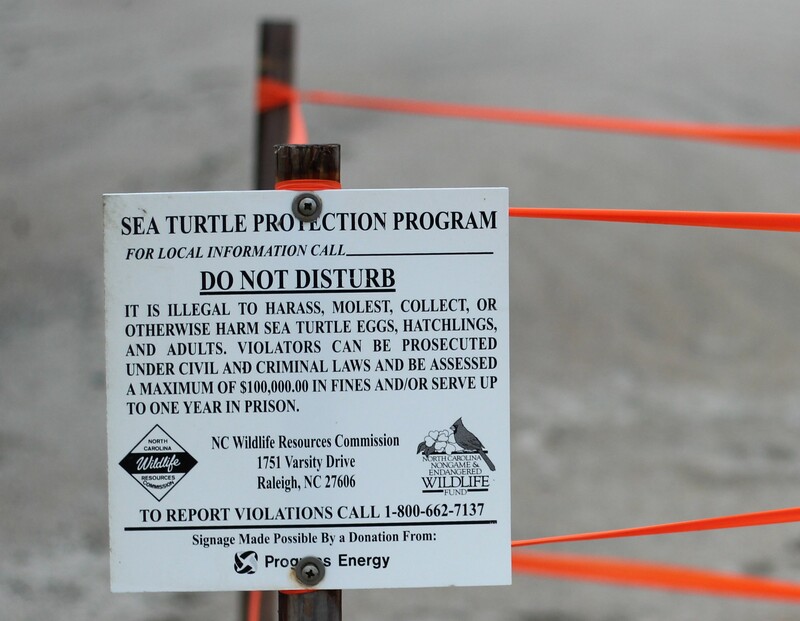 This entry was posted in Abortion, Evangelism and tagged abortion, abortion clinic, Jones Franklin Road abortion clinic, turtle eggs on August 1, 2014 by Jason Dohm.